Only a few years ago many thought the Green Line was just a pipe dream. However, through consistent and determined advocacy, what was once only a plan is now part of the largest public transit project in the history of Alberta. I am very proud to be an advocate for the Green Line! I also want to thank my colleague from Ward 12, and my Federal colleagues, who saw the potential of this project and who have supported this vision from the beginning. They saw how this project will completely change how Calgarians move around the City. This is our opportunity to ensure tax dollars are spent on an infrastructure project that provides the most benefit, to the greatest number of Calgarians, and not spent on more legacy projects that serve the wants of few Calgarians. Total city population today is 1.20 million, increasing to 1.89 million by 2043 and 290,000 Calgarians are estimated to live along the Green Line corridor, expecting to increase to 465,000 by 2043. The Green Line is Calgary’s next light rail transit (LRT) line, and is the highest public transit infrastructure priorities for the city. The Green Line is designed to be both a transit system and a platform for development and City Shaping; it will provide efficient service and connections to destinations throughout the city, and areas where people can live affordably with access to amenities, services, and sustainable mobility options. 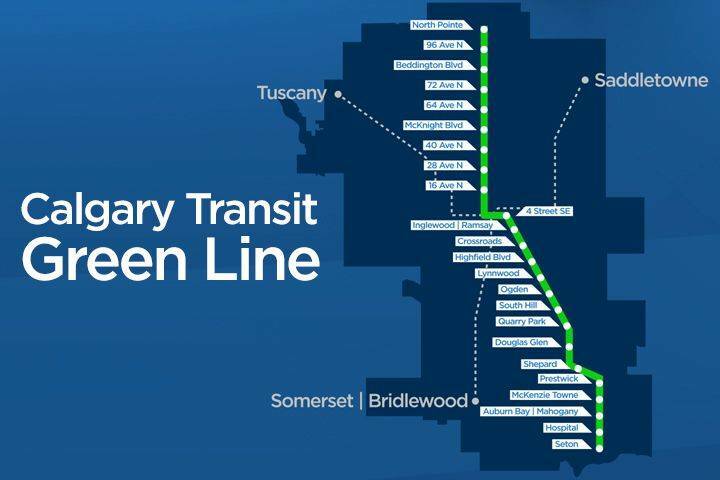 The Green Line will be an important piece of Calgary’s transit network, adding 40 kilometres of track to the existing 59 kilometre LRT system. End-to-end, it will connect communities between Keystone and Seton to downtown and various other destinations along the way. Once the full alignment is built, the line will carry an estimated 90,000 – 140,000 trips per day. The Green Line was initially planned to be built as bus-only lanes called a transit way. While a transitway would not provide the capacity and reliability of an LRT service, this option would improve service in communities, without the significant initial capital investment required for LRT. The transitway was planned to be extended and converted into an LRT line in the future, as funding became available. In July 2015, the Government of Canada announced that up to $1.53 billion from the Public Transit Infrastructure Fund would be awarded to the Green Line as an LRT project, contingent on The City’s application. This announcement offered the opportunity to explore building the Green Line as an LRT from the beginning, providing all three levels of government could provide matching contributions. Why is the Green Line Needed? Mobility trends in Calgary are changing, with a shift towards increased transit ridership. Between 2011 and 2011, there was a 4.8% increase in the number of people who took transit to work from 13.9% to 18.7% (City of Calgary, 2013, p. 19). For communities traveling to the downtown core, there was an increase in transit mode share from 36% to 45.7% between 2001 and 2011 (City of Calgary, 2013, p. 19). 57% of transit users are under 30 years old (City of Calgary, 2013, p. 19). These trends indicate that as population grows and development occurs around stations (Highland Park, 72 Ave, and Beddington for Ward 4), more people will choose to live more transit orientated lifestyles, increasing the percentage of people using transit. Increasing the reliability and capacity of the transit network will be essential in meeting the demand for efficient public transit. Road congestion is an ever increasing issue in Calgary as the city grows. Investments which contribute to reducing congestion are crucial from an environmental and economic/productivity standpoint. There will be a cost to addressing road congestion either through investing in road infrastructure or investing in transportation alternative. Investing in transportation will reduce the number of vehicles on the road, increase productivity with fewer people waiting in traffic, and reduce greenhouse gas emissions. The number of jobs along the Green Line route are expected tin increase over the long term, despite the current economic downturn. There is expected to be over 100,000 new jobs created in north and southeast Calgary over the 25 – 30 years, creating destinations for thousands of Calgarians. Some parts of the Green Line will be underground, likely 16th Ave and McKnight Blvd, the rest will be over land. There will be traffic congestion due to lengthy construction, but overall the Green Line will be a positive thing for Ward 4. When the Green Line is completed, how Ward 4 residents use transit will also change. New bus routes will be designed in order to bring residents to LRT stations instead of the downtown core. Centre Street is the most heavily used transit corridor in Calgary, and the Green Line will help more residents move more efficiently throughout Calgary. The Green Line will take vehicles of the road, increase the ability to use public transit for nearly 300,000 Calgarians, and will help further integrate Ward 4. 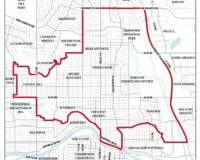 This is good news for you, our Ward, and Calgary! Federal Government: On Saturday, December 3, 2016, the Government of Canada and the Province of Alberta announced funding that will bring The City of Calgary one step closer to beginning construction of the new Green Line LRT. The funding, which comes from the federal Public Transit Infrastructure Fund (PTIF) and the provincial Green Transit Incentives Program (GreenTRIP), will provide transit infrastructure funding to more than 25 municipalities across Alberta. In Calgary, the funds will help prepare the Green Line right-of-way for construction with items such as utilities and land. Provincial Government: Funding discussions are ongoing with the Government of Alberta. The City applied for funding through the Province’s Green Transit Incentives Program (GreenTRIP) on August 31, 2016. Municipal Government: In December 2015, The City committed $1.56 billion over 30 years, contingent on matching contributions from the Federal and Provincial governments. The Green Line was viewed for many years and indeed during the 2010 Civic Election when I ran it was still just an idea, one that would not be realized for another decade or more. I was supportive of what was then the Centre North route, given that Ward 4 residents are the heaviest users of Calgary’s transit system, and Centre Street is the commercial and residential heart of the Ward. Here is the timeline of the Green Line; it shows how fast we have come in the past two years. The Green Lien team has done amazing work and their community outreach has been a success with all the Charrettes and they have kept Councilors well informed with new updates. 2011 – City Administration applies for Provincial grant to begin preliminary design and Transit Oriented Development study for the Green Line. 2013 – City Council allocated $52 million/year in tax room from the 2015-2024 to develop a dedicated transit fund to plan the Green Line. 2013-14 – Extensive public engagement & technical studies are done to identify a route for the north leg of the Green Line. Centre Street is selected as the preferred route by City Council. 2015 (January-September) – Public engagement & design work is done to confirm the route alignment, station locations and Transit Oriented Development (TOD) plans for the southeast leg of the Green Line. July – The Government of Canada announces up to $153 billion to the Green Line LRT project. November – City Council approves the route alignment, station locations and TOD plans for the southeast leg of the Green Line. December – City Council approves extending current 10- year commitment of $52 million/year toward the Green Line to 30 years. This brings the City’s total Commitment to $1.56 billion. 2016 – Ongoing discussion with the Provincial and Federal Government regarding funding for the Green Line. February – December – Public Engagement and design work to determine the Green Line Transit Oriented Development (TOD) plans & station locations for the north leg of the line. Ongoing public engagement to confirm TOD and land use plans in the southeast. June – City Administration to present update to City Councils Transportation & Transit Committee on recommended route alignment in the downtown core. September – Official recommendation for fully tunneled route in downtown core approved by City Councils Transpiration & Transit Committee. Beltline route alignment public engagement focused on 10 Avenue and 12 Avenue options. October – Official recommendation for fully tunneled route in the downtown core approved in principle by City Council. December – Beltline corridor (12 Ave S) recommendation approved by City Councils Transportation & Transit Committee. March 2017 – Beltline alignment (surface or underground) update presented to City Councils Transportation & Transit Committee. June – City Administration to present final recommendation to City Councils Transportation & Transit Committee on TOD plans, station locations, and route alignment in the north, Centre City and Beltline. 2017 and beyond – Ongoing public engagement, planning, and design. The Green Line LRT is currently under development. Public engagement is ongoing on the route, station locations, and Transit Oriented Development (TOD) plans. These plans will be presented to City Council in June 2017. It will be at this Council meeting that the final route and station locations will be considered by Council. The City has already been purchasing land along the Green Line route, and when Council votes in June for the final Centre North route with station locations there will be more clarity for everyone in Ward 3, Ward 4, and Ward 7. I know people have concerns and I am working with City Administration about the process, and what I can share with residents along the route to alleviate their concerns. More info will come in the coming weeks. Transit Orientated Development is how Calgary is growing in density in every part of the City, and will renew older communities in Ward 4. The Green Line will help drive the success of TOD, especially in Ward 4 communities of Highland Park and Beddingotn Heights. For more on TOD click here. Eleven stations along Green Line have been selected for study and land use policy planning as Green Line TOD Priority Sites. The sites were selected based on the geospatial data, market analysis, long term development plans, and stakeholder input )community, developers, and subject matter experts). The table below summarizes the forecasted developable area, forecasts population increase at TOD Priority Sites as office area development along the corridor. The Green Line will create jobs and Gross Domestic Product (GDP) growth, with direct benefits resulting from construction, operations, and maintenance. The Green Line LRT will contribute to the economy in Calgary and within Alberta in many ways. Job creation and GDP increase due to Green Line construction and operations. Green Line will create more than 20,000 direct and indirect jobs from 2017 to 2026. Approximately $15.6 billion in additional real gross domestic product will be created within the Calgary Metropolitan Area between 2016 and 2046. Increased property values. Assessed property values along the Green Line LRT corridor will increase by approximately $4.7 billion by 2046. This represents approximately $1.9 billion in present value terms. Increased income tax revenue. $940 million in additional Provincial income tax (between 2016 and 2046). Potential increased property tax revenue. Potential gains in property taxes to Calgary and Alberta are estimate at approximately $630 million in present value dollars ($450 million in property taxes will go to the City and $180 million will go to the Province between 2016 and 2056). Savings for households. Approximately 13,000 households are within 600 meters from a planned station. By utilizing the Green Line, these households are estimated to save approximately $4,000 per year on transportation costs. 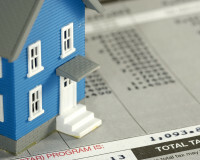 Savings are expected to result in approximately $1000 in additional annual discretionary spending for these households. Productivity gains. Preliminary estimates indicate that approximately 140,000 Green Line passengers (estimate opening day ridership) will see a reduction of up to 20 minutes per trip. The total annualized travel time savings for those Green Line passengers in the first year alone will be 1,300 hours, or approximately $3 million in labor savings. Contribution to economic diversification. Improvements in Calgary’s ability to attract diverse talent and business through transit oriented development. Directly reduce greenhouse gas (GHG) emission by 52,000 tonnes of carbon dioxide equivalent annually. Replace many bus trips, especially on Centre Street with an emissions free mode. Displace 22 million liters of gasoline and diesel fuel by powering the Green Line with renewable electricity (or lower carbon energy). Achieve efficiency gains with as few as 18 LRT passenger/train, which is the “break even” point for the LRT energy savings when compared to 18 automobiles. 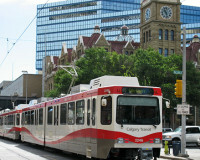 Leverage Calgary Transit’s previous investment and expertise in energy efficiency, pollution control, and renewable energy. Reduce a projected two per cent of Calgary’s smog-forming tailpipe emissions. Facilitate land use densification in transit hubs and corridors, resulting in further long-term environmental benefits. The Green Line aligns with the social priorities of the Provincial and Federal Governments. It is designed to improve quality of life by providing people with options on how to move, work, live, and play, and allows more affordable access to essential community services. Contribute to affordable lifestyles: nearly 35% of lower-income citizens use public transit to get to their everyday destination, compared to 17% of moderate income respondents (City of Calgary, 2015a, p. 16). 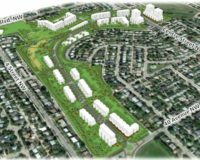 Increase potential affordable housing sites such as 64 Avenue N: transit is a key consideration for affordable housing sites (City of Calgary, 2015a). Provide positive health outcomes: transit users have been found to get 24 minutes of walking per day (meeting the recommended 22 minutes of physical activity per day)/. Connect citizens with recreation areas. Improving access to these centres will have both mental and physical heath benefits for citizens. Connect to the South Health Campus, providing an affordable alternative to access healthcare services. Supporting Cultural Vibrancy – Culture is a major economic engine in the local economy with over 50,400 people directly employed in creative industries in Calgary (Calgary Economic Development, 2015) The Green Line aligns with the cultural priorities of the Provincial and Federal Government as it will connect people to cultural facilities they may not have had access to previously. Cultural considers are foundational to planning spaces, places, policies, and programs. Increase connection to important cultural destination in the city, including the National Music Centre, Stampede Park, and the Inglewood/Ramsay art communities. Incorporate public art along the line. Provide connection to places of cultural significance such as Chinatown, a number of places of worship, and community and recreation centre’s. The Green Line is heading north along Centre Street with a station at 40th Ave. However the City is also currently working on a McKnight BLVD expansion west of Deerfoot. This means that some houses along the McKnight will be affected, and the implementation of sound barriers may be required. The existence of the Green Line, with street level rail means that intersection upgrades will be required. However, these intersections will be used to overcome traffic flow issues. Council last month voted in favour of the Highland Park Golf Course re-development. This means 2071 new units will be built in this area. Having a Transit Oriented Development (TOD) in this location is important to ensure best practice development and productive integration into the community. Being within the 600 meter TOD zone means that residents can leave their cars at home and walk to the station for their daily commute. With the Green Line coming to Ward 4, bus routes will be affected. As construction ramps up the City will provide information on how routes are effected. Once the Green line is fully operational bus routes will be altered in a more permanent manner. Again, as these operational developments begin to occur, the City of Calgary will provide residents with more information. In order to ensure that the Green Line gets built all the way north through Ward 4 we will need to continue to lobby the provincial government for their unconfirmed portion of funding. The total cost of the project will require funding from all three levels of government and we have only secured our municipal portion and the federal government funding. My colleagues and I will continue to advocate for the Province of Alberta to commit their funding for this project. I would encourage all Ward 4 residents to do the same. Write, call, and email your local MLA. They need to hear that this project is too important to you to not have the necessary funding. We have an opportunity to ensure tax dollars are spent on the largest public transit project in the history of Alberta and meet the needs of the majority of Calgarians. Let’s make sure that together we can make the Green Line a reality!